Skeleton Watches demonstrate the brilliance and virtuosity of mechanical watchmaking beyond compare. These sentinel timepieces exhibit the true sophistication of the craft by unmasking their magnetic intricate movements: the intertwining bridges, gears, and wheels performing their admirable kinetic ballet. While traditionally, the mechanistic framework of Skeleton Watches were ornamented with lacey, engraved embellishments, today’s Skeletons are more edgy, with a “less is more” theme. The year 2015 has been Christened “The year of Skeleton Watches” – a year in which serious watchmakers will make a distinction by designing luxury watches, With More Mechanics, and Less exorbitance. Among one of this year’s most anticipated collectors pieces, is the much anticipated ROTONDE DE CARTIER ASTROTOURBILLON SKELETON. 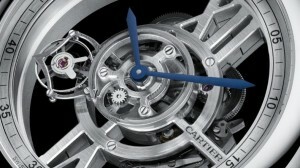 Virtuoso watchmaking manufacturer, Cartier, will unveil it’s latest iteration of their signature Astrotourbillon in 2015; this time in THE ROTONDE DE CARTIER context. It is a watch with a progressive and minimalistic character. THE ROTONDE DE CARTIER ASTROTOURBILLON SKELETON will carry on the legacy of the Cartier Fine Watchmaking collection, as a specimen of their superior horological ambition. 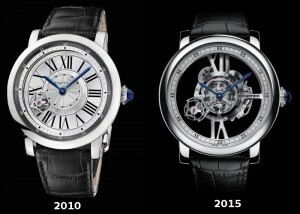 This watch is to be Cartier’s third Astrotourbillon since 2010. The Watchmasters have taken to lavish this model with some of the most complex movements that the company has ever invented. And Only 100 pieces of this inimitable model will be made available. 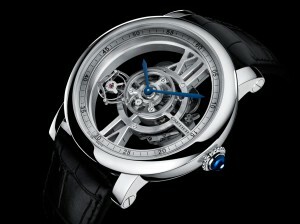 The Rotonde de Cartier Astrotourbillon Skeleton is a fresh interpretation of the Astrotourbillon complication. Craftily accentuated, completely exposed, and separated from all other superfluous mechanisms, it has been completely re-chiseled and designed in keeping with the most meticulous motifs of proportion, synchronization and poise. 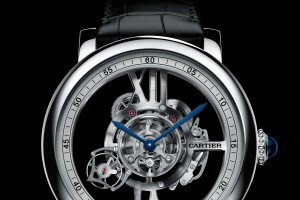 It is as a monument of artistic quality that Cartier has approached this crisp new interpretation of the Astrotourbillon. Making a smooth revolution around the dial each minute; and Anchored by the brand’s signature Roman numerals at 12 and 6 o’clock – It is Distinctly different from the traditional tourbillons revolving in their fixed strong-featured cages. This timepiece is designed with the aesthetic intention of showcasing the heart and soul of this edition in all its majesty, and to enhance the amplitude of its rotation. A minimalistic case middle and inner bezel emphasize the beautiful complexity of the dense, complex centre (the movement). Completely skeletonized and open-worked, the main plate of the CALIBRE 9461 MC movement is suspended on the imposing XII and VI numerals – a distinctive Cartier Architecture. 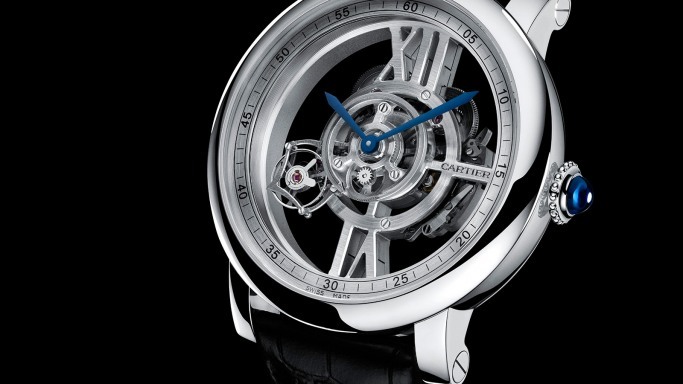 In this unique compilation, these bridges sturdily organize the calibre, distinguishing its appearance, and with the manual-winding of the 9461 MC movement – it appears to float in midair. Not to mention that the Rotonde Grande Complication is very wearable: the movement itself measures only 5.49 mm in thickness, a noteworthy feature for such a complex standard. The complete watch measures 45 mm in diameter and 12.5 mm in thickness – which is a far cry from the colossal discs that one tends to find in this class of luxury status watches. The watch is rounded off with a black alligator-skin strap, which is fortified with a double-adjustable buckle; set in 18-carats of sinless white gold. Only 100 pieces of the Rotonde de Cartier Astrotourbillon will be distributed in white gold; clocking in at a retail price of €120,000. Additionally, 20 unique pieces, out of platinum with bezels garlanded with baguette diamonds and case will be made available for €420,000, as well as a further five platinum pieces accompanied by matching bracelets, wrapped in diamonds, for a mere €1.3 million.